On the 2017 data (the latest available from VDOE), Richmond spent $2,578 per student more than the average Virginia division (data are disbursements, not including facilities, debt service, and reserves). Multiply that excess by the 22,916.17 students (Don’t ask me where 0.17 students come from.) and you get an excess expenditure of $59.1 million. Other data on the VDOE Web site can offer clues as to where that money is (or is not) going. Hmmm. 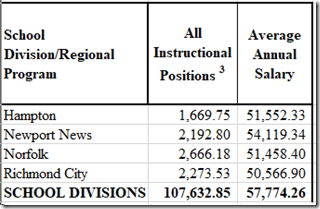 Richmond is paying its average teacher $7,207 less than the division average. That number times our 2,274.53 teachers (Looks like teachers also come in fractions.) tells us Richmond is saving $16.4 million per year from those lower salaries. 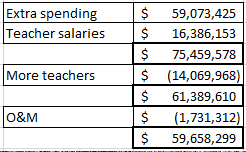 Versus the average, Richmond is spending that $16.4 million somewhere, but not on teachers, so let’s add the counterproductive salary saving to the $59.1 million excess expenditure. That gives a total of $75.5 million per year. Next, the number of teachers. If Richmond had extra teachers per pupil, the cost of those teachers could explain part of this $75 million. A little arithmetic tells us that, vs. the division average, Richmond is has an extra 278 teachers. At an average salary of $50,567, Richmond is paying $14.1 million per year for those extra teachers. We often hear that special education and poverty are major contributors to Richmond’s higher costs. It is difficult to come by data to quantify that. The closest I have come is SchoolDataDirect, the now defunct Standard & Poors data service that was supported by the Gates Foundation. The difference in adjustments is -6%; that is, on those (old) data, Richmond schools were 6% less expensive than average (in terms of “core” spending) because of those three factors. Based on that counter-intuitive result and the absence of current data, let’s pass on those factors. One final item: Richmond’s excess expenditure for O&M is $77 per student, a total of $ 1.7 million. If all that were justified (and given the sorry state of our old school buildings, Richmond surely could justify a much larger O&M expenditure), Richmond would still have been spending an extra $59.7 million on something. Richmond’s disbursement total (as with all the numbers above, not counting facilities, or contingency reserves) was $344.2 million. (That’s right, just over a third of a BILLION dollars!) The $59.7 million excess was 17.3% of that total. What we got for that money was the third lowest reading pass rate and the second lowest math pass rate in the state. Until RPS can explain where all the money is going and what they are going to do to redirect it to a useful purpose, there is no reason at all to increase the school budget. 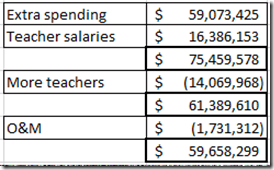 To the contrary, these data make a case for cutting the RPS budget by at least $59.7 million.